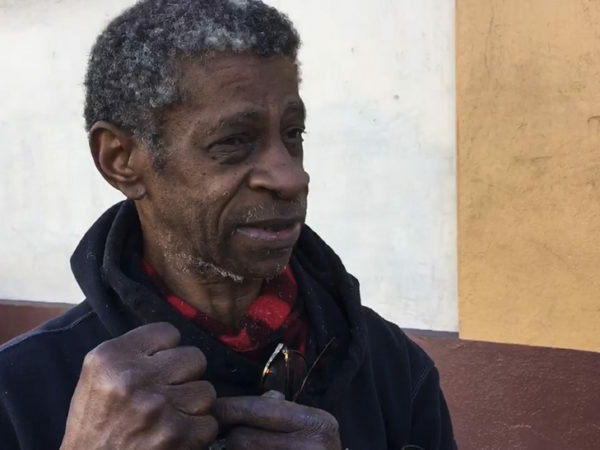 When Amos Howard left the hospital after an overnight stay, a taxi dropped him off at the corner of 18th and Shotwell streets. 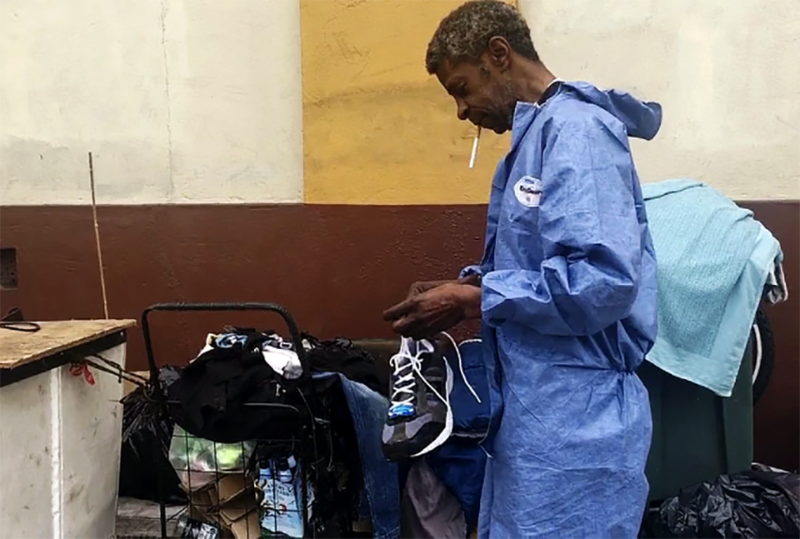 Howard remembers heavy rains on that day – his forearms were locked in fresh casts and, already homeless for a year and a half, the 59-year-old U.S. Army veteran had nowhere to go. “They didn’t give me a voucher to go to a hotel or anything, so I said, ‘I guess this is the safest place,’” said Howard, who had ended up in the hospital after someone stole the money he had made recycling cans, beat him up and left him with two broken wrists. That was a year ago. Howard is still on the streets and the story of the last year is filled with failed attempts to reach out to him, some miraculous chance encounters, and a refuge of sorts. The next morning, he met Father John Jimenez, the pastor of St. Charles. Father John beckoned to Howard, then set up across the street at the school, to move his camp to the sidewalk alongside the parish’s walls. He gave him a tent and told Howard he would be more comfortable there. Since then, Howard has been living in in the shadows of the parish. He he feels safe there. Howard says that Jimenez provides him with clothing, food, and candles when he needs them. Howard uses the church’s restroom to clean up, but says he limits his time inside the church. “It would be a conflict for the church members,” he said. As it turns out, Howard is also a man of the ministry. Howard found God during his service and became a chaplain’s assistant. That however, failed to protect him from his own demons. He is one of some 215 chronically homeless veterans. Although President Obama pledged to end veteran homelessness by 2015 and increased resources and housing vouchers, some, like Howard, remain on the streets. A 2016 study published by the Department of Veteran Affairs placed the veteran suicide rate at 20 per day in 2014. “The veteran [homeless] community has more access now to resources than non-veteran [homeless] community,” said Kevin Miller, a spokesperson for Swords to Plowshares, a low-barrier city agency that offers wrap-around services dedicated to housing veterans. Still, while one in three homeless veterans in San Francisco is eligible for the federal vouchers, finding landlords willing to accept them is difficult, Miller says. Others, like Howard, who have suffered trauma in combat or on the streets, are prone to substance abuse and mental illness, and resist services for varying reasons. Jake Martin, director of the San Francisco VA Comprehensive Homeless Center, agrees that outreach must be consistent, especially among chronically homeless veterans. For the past year, Gregory said he has stepped in to do the work that he says city agencies have failed to do – getting Howard setup for transitioning off the streets and into housing. Howard said he hasn’t seen his case manager in over seven months. “Nobody comes here, that’s what I don’t understand. 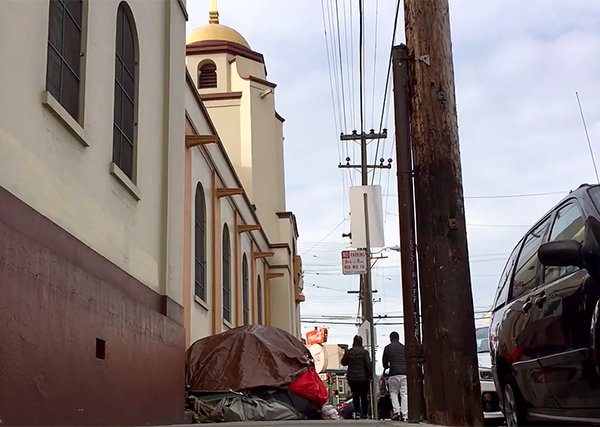 I’m right around the corner from the Shotwell [encampment],” he said, referring to a sprawling homeless encampment that occupied a stretch of Shotwell Street between 18th and 19th streets, and was recently dismantled by the city. The encampment’s residents were moved to shelters – but Howard’s tent, just around the corner, remained. To draw attention to Howard’s case and to push the issue of veteran homelessness onto the agenda of city leaders, Gregory even camped outside of City Hall. Still, the public shaming failed to result in housing for Howard. Gregory said that after he posted a picture of Howard’s tent online, outreach workers from Swords to Plowshares made contact with Howard. But when he missed two appointments with the organization in August and in October – because he was unable to leave his tent behind for fear of being robbed, he said– the engagement stopped. Miller, from Plowshares, said that Howard’s case was documented in their system. Both times the organization attempted an intake with Howard, he was a no-show, said Miller. He explained that the organization has a robust outreach program that partners with other city agencies, such as the Homeless Outreach Team and BART to comb neighborhoods for veterans. Once identified, veterans are offered emergency shelter and are later connected to housing, either within the agency’s supportive housing units or through landlords signed up with a federal voucher program known as HUD-VASH. “We have a fairly low turnover rate under supportive housing,” said Miller referring to the few vacancies. Following Mission Local inquiries, Howard was transported to the organization on Tuesday for another intake. There, he was told that he is on the priority list for housing with the vouchers issued by Department of Housing and Urban Development and the Veterans Affairs Supportive Housing Program, and is now awaiting approval of his application to meet with a housing specialist. He was offered emergency shelter and a spot at the city’s Navigation Center, and has previously turned down offers for temporary housing, said Miller. Howard acknowledges that he has his own expectations of what his housing should look like. Before becoming homeless, Howard was living in the Mission Hotel, but an eviction put him out on the streets and he was glad for it. On the streets, Howard also does not do well living with others. He said he’s been ostracized from the Shotwell Street encampment. Depending on Howard’s assessment, he could be placed in supportive housing or he will have to find a landlord willing to accept his voucher. Howard is hopeful, but acknowledges that he has grown bitter about being stuck in limbo, and disillusioned by those tasked to help him. See the video of Amos Howard talking about his experience here. I also want a one bedroom apartment.